If there's any room in the house that should instantaneously transport you to a state of Zen, it should be your bedroom. As the place where you start and end your day, your sleeping quarters are really meant to be a refuge for self-care rituals and of course, getting the best night's sleep possible. But we're not all the Dalai Lama, and sometimes finding inner peace within our bedchambers seems to be totally out of reach. Yup, we're all human, but we can achieve a small slice of that Buddha-like tranquility by starting to think of our bedrooms as an oasis for relaxation, reflection, and to gather strength for the upcoming day. And to make this process easier, you can start by retooling your decor so you feel calm every time you look around the room. Scroll on for nine zen bedroom ideas to help you find your center. 1. Cozy up to soft textiles. 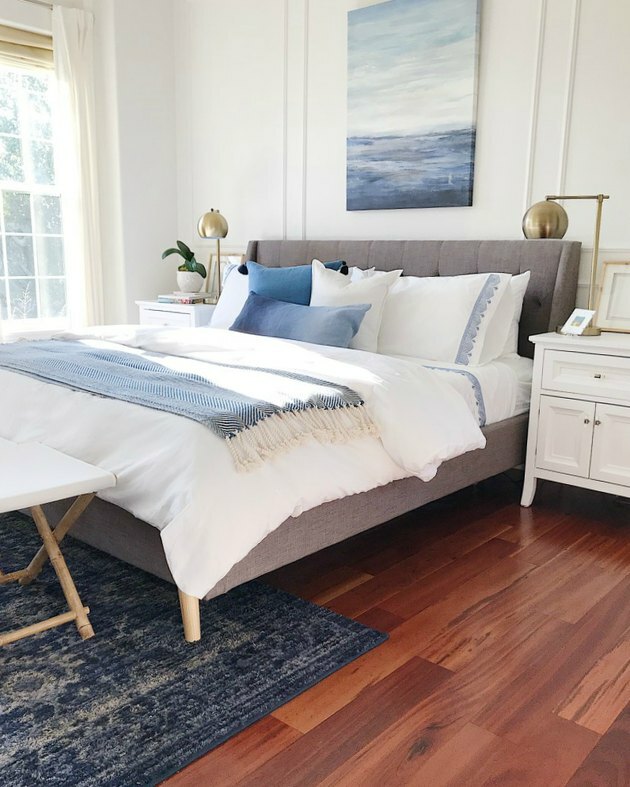 You can quite literally soften up your surroundings with pillows, blankets, linens, and floor rugs — creating a sanctuary where you'll be inspired to relax and unwind. Emily Henderson has the right idea in her bedroom, where she's included soft cuddly textiles in a variety of dreamy textures. 2. Get inspired by peaceful places. Close your eyes and picture the place where you feel most at ease. 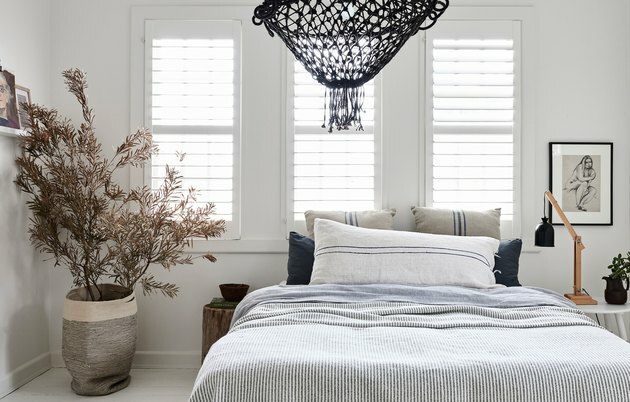 If it's the ocean, the mountains, or a tropical hideaway, weave that theme into your own bedroom. 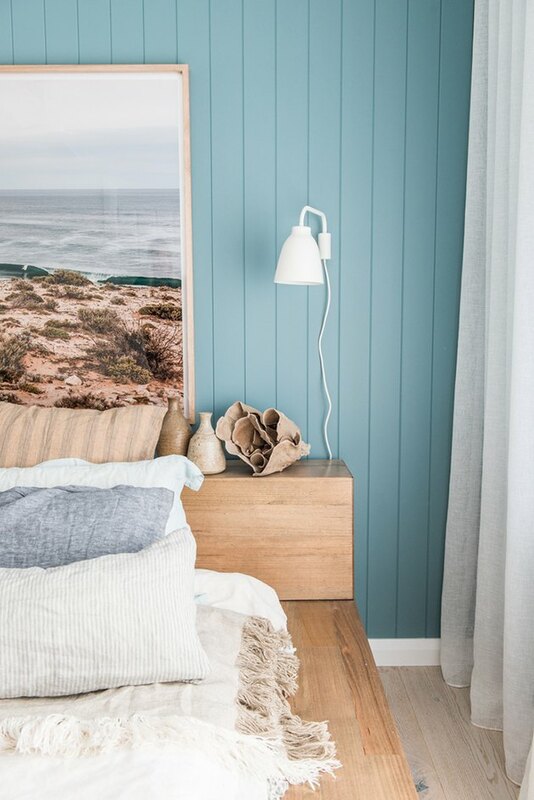 The sea always seems to inspire relaxed vibes, and here in this bedroom designed by Kyal and Kara Demmrich, the coastal-chic look takes a modern, soothing turn with a turquoise accent wall and seaside decor. Sure, a bed is a great spot to land at the end of the day, but to dial up the comfort level, be sure to wrap in a few comfy places to sit, too. This can act as a meditation nook or a chair meant for reading — a place to wind down that isn't your bed. Iris Nacole displayed two simple, accent chairs at the foot of her bed that serve this very purpose. 4. Tone down the colors. 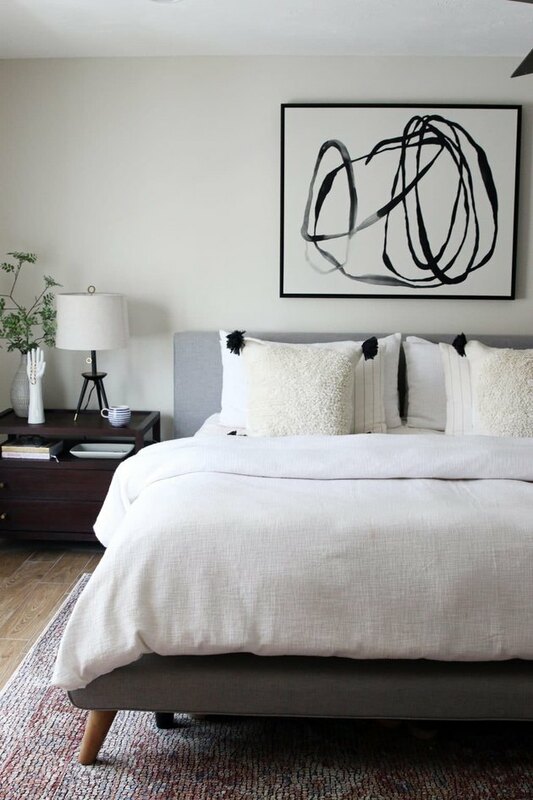 To enhance the neutral palette in their bedroom, the couple behind the blog Chris Loves Julia replaced their artwork with an abstract piece that punctuates the black-and-white accents throughout the room. The end result is a quiet, toned-down space that allows the eyes to rest. It's been scientifically proven that representing nature in our homes can improve mental wellness and overall health. What better place to give your brain a boost than in your bedroom? Take a page from this sanctuary belonging to Melbourne-based designer Lynda Gardener and bring a bit of the outdoors in. Include a big, beautiful beautiful plant or decorate using wood and other natural materials. 6. Let the sun shine in. Sunlight is so good for the soul, and when it streams in through your bedroom window, it can double as an all-natural alarm clock. For a cheerful, calming ambiance in your space, include window treatments that open all the way, and won't block any natural daylight. 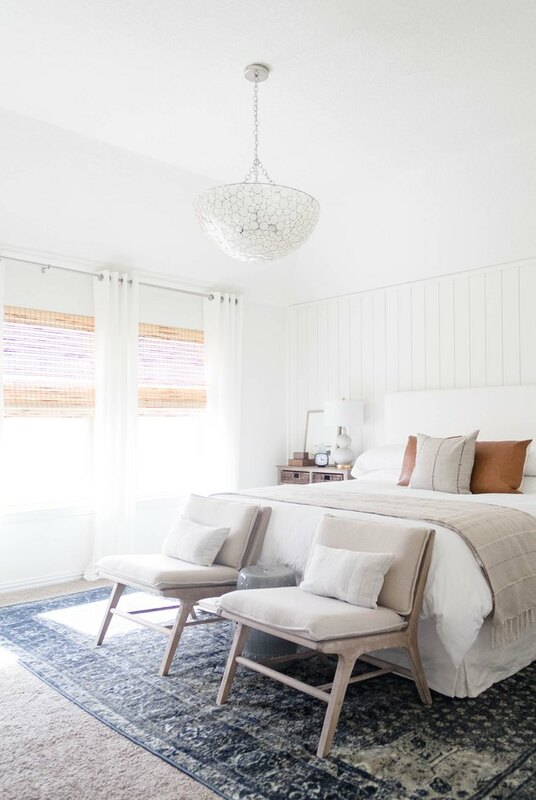 We're loving the sunny look in this serene space styled by Jane of Jane At Home. Clutter is a surefire way to feel stressed out in a hurry, so be sure to include plenty of storage solutions in your bedroom. 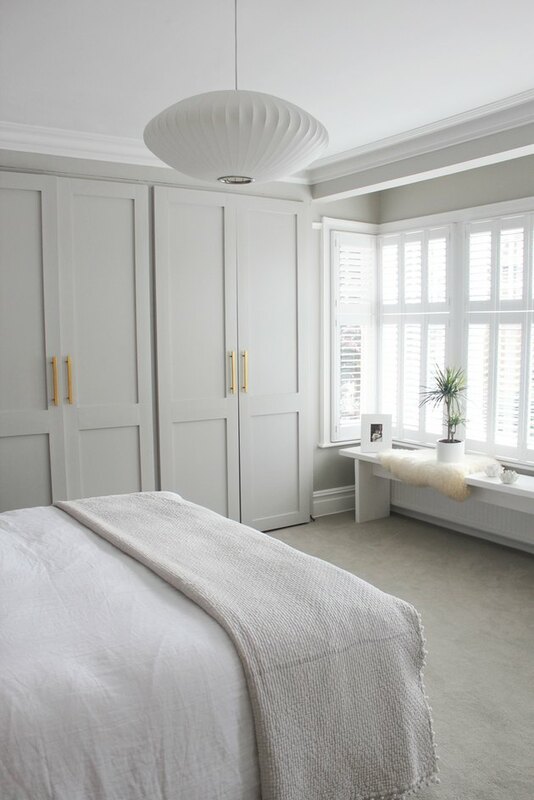 In this cool, calm boudoir belonging to blogger Anneli Bush, big cabinets keep clutter at bay. The only objects in sight are a few carefully chosen pieces of decor. 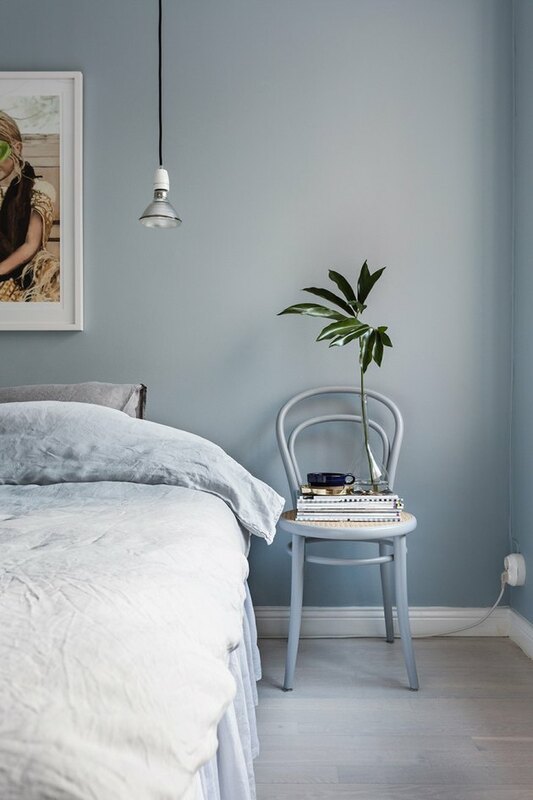 We definitely dig colorful bedrooms, but there's something to be said for sleeping quarters in muted, unfussy hues. 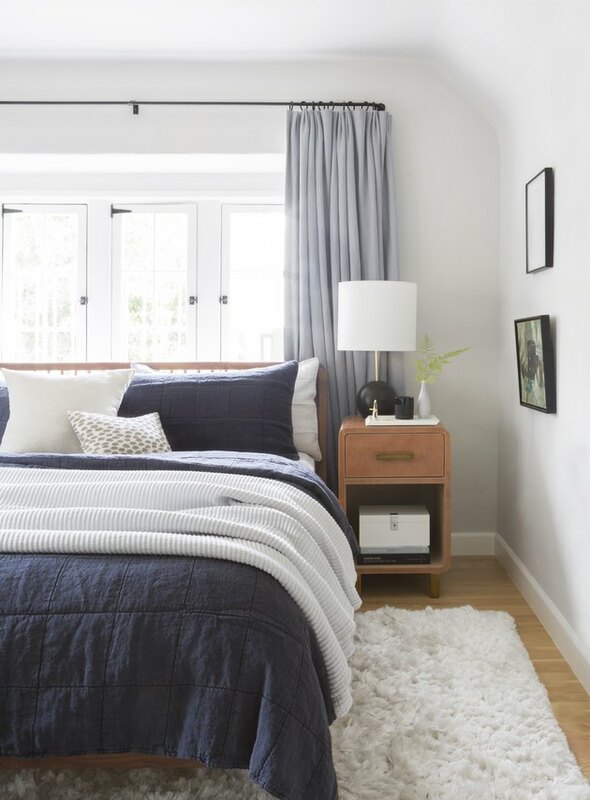 A monochromatic bedroom is a good option if you're easily overwhelmed — this way, the eye only has to take in one shade, which can make things seem more peaceful. This cool space styled by Fantastic Frank in light blue tones represents that monochromatic trend perfectly. It can be fun to put lots of tchotchkes all around your living space. 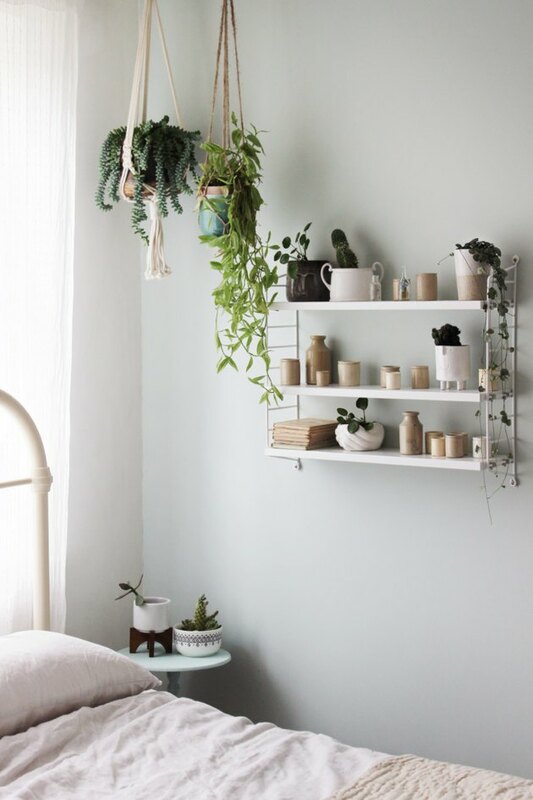 But for your bedroom, we recommend paring down your collection to thoughtful, intentional objects, like a few beloved houseplants and a special selection of decorative treasures — which is exactly what Heather of Growing Spaces did in her own bedroom.